paper reader is going to bea! Yes, that's right! I shall be attending my very first Book Blogger Convention (now Blogger's Conference) along with Book Expo America. Since I'm from New York, having it happen in my backyard last year and not be able to attend was a bit saddening, but I'm grateful that I'm able this year. My whole reason for going is to be able to meet those of you who I've been communicating with for a little over a year now and chat shop: books books books. You guys are what makes this fun. Without interaction I doubt that I would have wanted to continue, because your intelligent conversation and insight is what makes it all worth it. If you see me, please say hi! I'll be changing my photo on Twitter so that you guys can more easily recognise me for the duration of BEA. I'll also be attending the young adult author breakfast, so if you'll be there, let me know! In fact, if you'll be at BEA please let me know in a comment/email/DM so that there can be fun BEA adventures. I very much look forward to seeing everyone! And I will tweet as best I can for those who cannot make it, and I miss you heaps. Please note there will be minor spoilers for Shift (Shade #2). With Logan now a ghost, Aura can begin to wrap up the mourning process that began almost a year ago - this time for his ghost. Safe in the knowledge that Zach and his family are on a plane home to the UK, Aura is ready for as normal final year of high school as anyone can be when you're able to see ghosts. Then Aura gets a call that changes everything, unwinding a thread that begins explains Aura being the first and Zach being the last over the course of a harrowing adventure. 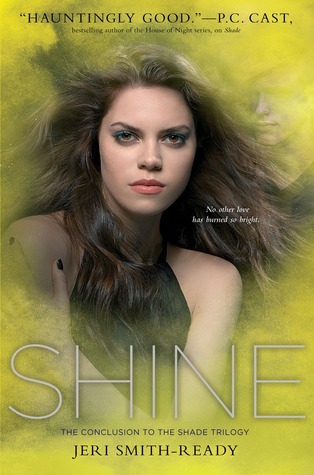 I'd been looking forward to Shine ever since I finished Shift, although I have to say there was a bit of trepidation coming into this one. There were some things in Shift that really didn't sit well with me, the biggest being the blasé outlook toward physicality. I know the whole point of, for example, things that happened between Logan and Aura exist to display the conflict that she's going through, but the few interchanges between Aura and Dylan just rubbed me the wrong way. I was slightly nervous that this book would carry that on and that, perhaps, Logan would never fade. Thankfully that wasn't the case with Shine, and to be fair, I enjoyed this installment much more without Logan. In fact, my favorite Logan moment in the series appears at the end, which was a rather nice way to tie everything up. Aura definitely had the opportunity to explore herself more, even if it was in the setting of chasing down information. Aura is an enjoyable MC for me as she has that appealing headstrong quality without being overwhelming, but also the sense to merely observe if the matter calls for it. Not to mention that Smith-Ready has Aura's voice down perfectly; a lot of times it's difficult to get into a character, despite how strong of a character they may be, if the right presentation of words isn't there. It's very easy to fall into Aura's head, which makes the progression of the story much swifter. My favorite thing, though, about the book, is the world building. I know that this is something I discuss quite often (especially with dystopian novels), but this series is a great example of where the premise of the story (Aura's and Zach's history) wonderfully sets the background without beating the reader over the head with it. We know why Aura lives where they do (Maryland), we know even a bit about her lineage (her Italian grandmother lives in Philadelphia) and there are relevant hints back to this as the story unfolds that is a pleasant connection of information. What brought me to this series is the idea of a Shift in the first place and the way it was so seamlessly integrated into a recognisable present-day society. What kept me was that, with this last book, we know why it happened and what, if anything, can be done about it. A well-done tying up of events with an interspersion of characters that take the story and run with it in a good way. Shine is my favorite installation of the trilogy, and was truly a wonderful way to finish the series. If you're looking to read a paranormal without instashipping, partnered with a well-researched and well-integrated premise and story then you'll definitely enjoy this series. Thanks again to Simon & Schuster, and I'm looking forward to what else Smith-Ready will create in the future. reading trends affecting overall reading? I'm fully aware that the title reads like a social science research topic and - if that were my area of study, and perhaps even if it weren't - I would absolutely love to write that paper. Considering I spend the majority of my time these days reading political theory & philosophical abstracts I can't help it. But I seriously digress. One day my mum asked me if I read or had heard of Fifty Shades of Grey and I perked up, commenting that I had. It wasn't until a few days later that I had completely confused it with Between Shades of Gray by Ruta Sepetys. I have read neither, but only one of them is on my TBR. I'll let you guess which one. The question I'm most concerned with, then, is what, if any, affect does this have on readers and reading? There was huge discussion during the height of Twilight fame that, despite the story, it was good that people (not just children, either) were reading. People were buying books, going to the library. This is a good thing, it was said. Fifty Shades is apparently doing much of the same, given both its sales and rampant discussion in both the media and blogosphere. I am a reader and I love when people want to pick up a book and become immersed in a new world. 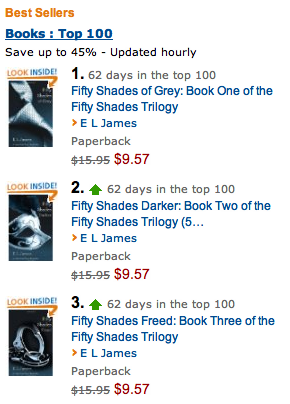 So is it a good thing that people are reading these books? Does the reading of these books help people to read more, and is there anything to say about society in part due to the books that are trending? I don't have an answer to this question, but I think about it often. There's never any one answer, and, honestly, never any one right answer. But I'm curious to see what you think.